A hike to the foot of Mont Blanc. Since Saint Gervais, we climb to the Eagle's Nest with a balcony path which dominates the Bionnassay glacier. Then the progression becomes more physical in the Desert Round Stone. The place is ideal for observing the dome of the Gouter refuge and well visible. 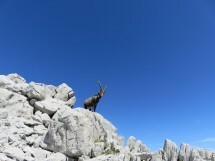 It is also a paradise for ibex. Elevation gain 1200 m, 13 km distance. Total length without breaks 6 hours. Meeting point at 07:45 at the French side of the Moellesulaz customs, in front of the Librairie de France.